SAN DIEGO, Sept. 28, 2010 -- Northrop Grumman Corporation (NYSE:NOC) and Bell Helicopter, a Textron company (NYSE:TXT), have moved a significant step closer to being able to offer military users a vertical unmanned system that can ferry cargo – either internally or externally – over extended distances. On Sept. 17, the team applied external power for the first time to the main computers and associated subsystems for its new Fire-X medium-range vertical unmanned aerial system (VUAS), currently in final integration and test at Bell Helicopter's Xworx rapid prototyping facility in Fort Worth, Texas. First flight for the new extended range, cargo-hauling VUAS, which is based on the FAA-certified Bell 407 airframe, is expected by the end of CY2010. "The Fire-X 'power-on' sequence, which validates the integrity of the electrical system, went exactly as planned," said George Spongberg, Northrop Grumman's Fire-X program manager. "It confirmed that the air vehicle's vehicle management system has been configured properly, and that all of the air vehicle's new wire harnesses are delivering power at the right levels to all of the major subsystems." 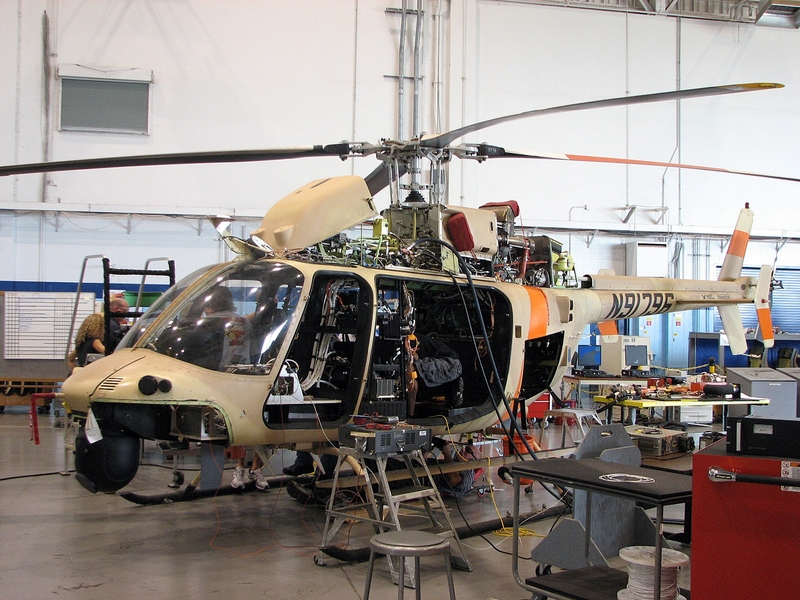 Fire-X's new wire harnesses were produced, tested and installed by Bell Helicopter, he added. The power-on event follows four months of Fire-X vehicle modifications at Xworx to convert a commercial Bell 407 from a piloted vehicle into an unmanned or optionally piloted vehicle. The modifications included not only removal of non-mission-essential equipment such as seats and sound insulation, but also installation of new wire harnesses and avionics required to control the vehicle in an unmanned configuration. "The challenge," explains Spongberg, "is to duplicate, using hardware and software, the behavior of the air vehicle when it is flown by a human. For example, we're installing and testing actuators that will move the air vehicle's flight control surfaces in response to commands from a ground control station the same way they would move in response to commands from a pilot in the cockpit." The team is also installing and validating the software that will perform critical guidance, navigation and control (GN&C) functions for the new system, he added. Over the next month, the Northrop Grumman/Bell Fire-X team expects to conduct preliminary flights of the air vehicle in Fort Worth in a manned configuration to validate its GN&C system, then convert it back to an unmanned system. After completion of ground testing and engine runs, the air vehicle will be ferried, in an optionally piloted configuration, to the U.S. Army's Yuma Proving Ground, Ariz. for final testing before Fire-X's first demonstration flight in an unmanned configuration. Fire-X is a fully autonomous, four-blade, single-engine unmanned helicopter that combines the best of two proven air systems in a low cost, fast-fielding package: the versatile reconnaissance, surveillance and target acquisition architecture of the U.S. Navy's MQ-8B Fire Scout vertical takeoff and landing tactical UAV, and the extended range, payload and cargo hauling capabilities of the commercially mature Bell 407 helicopter. Fire-X offers commanders a useful load of more than 3,000 pounds – for fuel, payloads and/or cargo. That load can typically support intelligence, surveillance and reconnaissance missions up to 16 hours long, or cargo missions of 2,500 pounds out to a range of 110 nautical miles. Please visit www.as.northropgrumman.com/products/fire-x/index.html for more information about Fire-X's capabilities and specifications. Bell Helicopter, a wholly owned subsidiary of Textron Inc., is an industry-leading producer of commercial and military, manned and unmanned vertical lift aircraft and the pioneer of the revolutionary tilt-rotor aircraft. Globally recognized for world-class customer service, innovation and superior quality, Bell's global workforce serves customers flying Bell aircraft in more than 120 countries. More information is available at www.bellhelicopter.com . Forward-looking Information: Certain statements in this press release are forward-looking statements and speak only as of the date on which they are made, and we undertake no obligation to update or revise any forward-looking statements. These forward-looking statements are subject to risks and uncertainties that may cause actual results to differ materially from those contained in the statements, including but not limited to the following: (a) the efficacy of research and development investments to develop new products; (b) the timing of new product launches and certifications of new aircraft products; (c) the launching of significant new products or programs which could result in unanticipated expenses; (d) changes in worldwide economic and political conditions that impact demand for new products, interest rates and foreign exchange rates; (e) changes in national or international funding priorities, U.S. and foreign military budget constraints and determinations, and government policies on the export and import of military products; (f) changing priorities or reductions in the U.S. Government defense budget, including those related to Operation Enduring Freedom and the Overseas Contingency Operations; (g) performance issues with key suppliers, subcontractors and business partners.